The first permanent settlement in Wisconsin was in Hazel Green in 1825. In 1831, surveyor Lucius Lyon began surveying the land just south of what is now known as Hazel Green. South of Hazel Green stands a historical marker for the “Point of Beginning”. 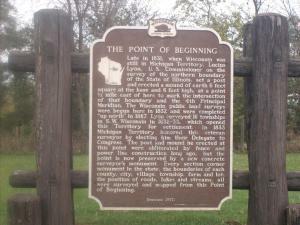 The survey point was marked in 1831 by Lucius Lyon, a surveyor who participated in the survey parties that established the baseline and the 4th Principal Meridian used to determine townships in the State of Wisconsin. To mark the spot, Lyon and his survey party inserted an oak post in a mound that was six feet tall by six feet square. This is the place where all land that was to become Wisconsin would be measured. Originally, the Village of Hazel Green was under the jurisdiction of Hazel Green Township. The Village was incorporated on April 9, 1867 and re-incorporated on April 21, 1880 by election. Many zinc ore producing mines were located near Hazel Green during the mining boom on the late 19th and early 20th century. Hazel Green was along a major stagecoach transportation route to Mississippi River communities in the 19th century.